A reader on Reddit asked me to post the story that goes with the great croc attack cover I recently posted from the January 1958 issue of Man’s Conquest magazine. The story is titled “The First Time I Died” and you can click this link to download it in PDF format. It’s just one of the over-the-top stories from that issue of Man’s Conquest. I posted a couple of others – about “C-girls” and thorium prospecting – in a previous post. The illustration for the croc attack story is basically a duotone version of the cover painting, which was done by the talented magazine and book illustrator George Gross. I have another men’s adventure magazine in my collection that has a cool crocodile attack cover. It’s the August 1957 issue of Rage for Men. The painting is for an article titled “I Ran the Rapids of Hell” by Arthur J. Burks. Unfortunately, the artist is not credited. As a magazine title, Rage for Men has always intrigued me. 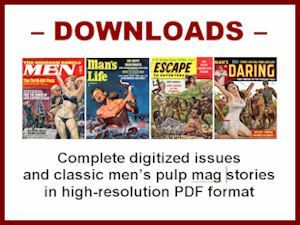 Even in the testosterone-filled world of men’s pulp magazines, it stands out. What was the target of the rage? Everything? Was it aimed at readers who were just damn angry at the world? If so, I guess there weren't quite enough raging dudes, because relatively few copies of the magazine were published. 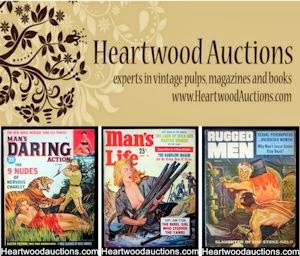 The first series, which amounted to less than a dozen issues, was published by Arnold Magazines in 1956 and 1957. A second series of more than a dozen issues was published by Natlus, Inc. (using the shortened title Rage) from late 1961 to mid-1964. So, there aren’t many issues of Rage for Men/Rage floating around nowadays, making my August ‘57 copy one of my prized mags (even if the cover is a bit faded and torn). 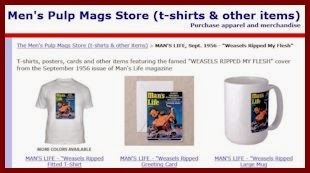 Where do I get the info about dates and publishers of men’s adventure magazines? 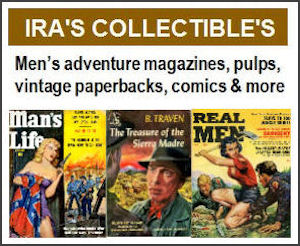 My two primary sources are books I’ve mentioned and recommended here before: It's a Man's World: Men's Adventure Magazines, the Postwar Pulps by Adam Parfrey and Men's Adventure Magazines: In Postwar America by Max Allan Collins and George Hagenauer. 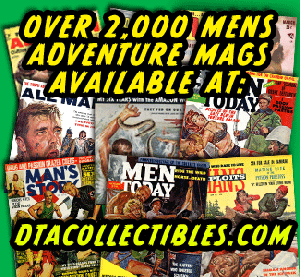 If you’re a fan of men’s adventure magazines, you’ll enjoy both of them immensely.